SunFX Spray Tan is truly incomparable to anything else on offer in the world today! Take 5 minutes for your spray and then shower in only 5-12 hours. You will be left with an unbelievable tan that will continue to darken over the next few hours and last between 5 – 10 days (depending on skin type). 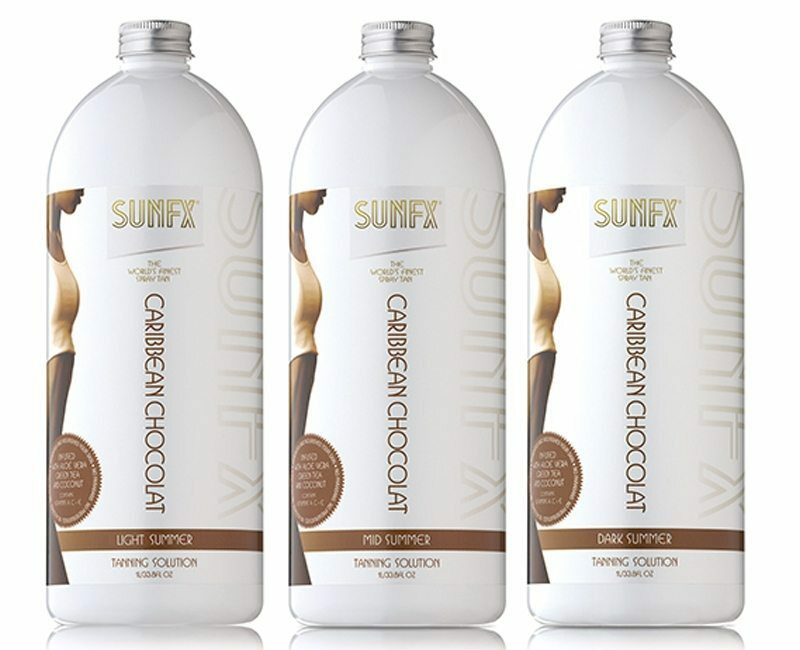 This exclusive SunFX Spray On Tan is regarded the world over as one of the finest. The unique combination of natural bronzers, highly purified water (aqua) and the approved cosmetic tanning agent DHA produce a truly remarkable tanning result. This product is unique and clients can be assured that it contains no alcohol, oils, perfumes, parabans or artificial preservatives so it’s great for even the most sensitive skins. It is recommended you cleanse and exfoliate your body like areas as knees, elbows, ankles, heels and the tops of your feet. This will ensure the best possible result from your spray tan by eliminating the top layers of dry and dead skin. It is also best to wax or shave at least 24 hours prior and avoid the use of deodorants, moisturisers, perfume and make-up that may inhibit the effectiveness of the SunFX tanning solution. It is recommended that you wear loose and comfortable dark clothing when you go to get your spray tan. The SunFX tanning solution will not stain clothing in most cases and any slight rub-off should come out in the wash. However, some staining may occur on sensitive fabrics. When getting your Spray on sun tan you may wear as little as you like. Most people wear just a G-String but this is a personal choice. Most people can expect their SunFX Spray tan to last for up to 7 – 10 days depending upon your skin type / preparation. Your spray tan can be extended through moisturising. SunFX will, on nearly all skin types, provide an impressive and natural looking tan. In fact in many instances, the result of our Spray Tan can be superior to sun and solarium exposure.